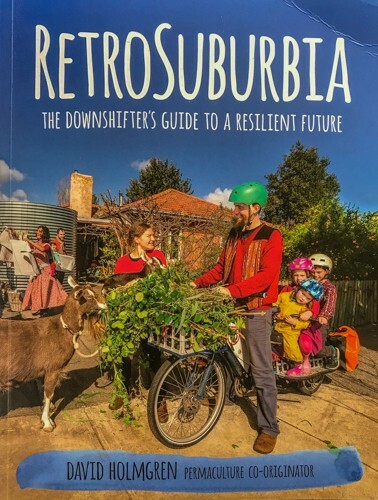 At the 2018 New Economy Network Australia conference in Melbourne, David Holmgren spoke with me about reviewing his 2018 book, Retrosuburbia. I said a critical review would be unlikely as I agree with much of what he wrote. In this and the reviews of other chapters of Retrosuburbia that will follow, I comment on the book is a supportive way while discussing ideas I see needing further exploration. I’VE STARTED TO READ David Holmgren’s 2018 book, Retrosuburbia. At 592 pages the book does take some reading and at 1.98kg it would pack enough kinetic energy that were you unfortunate enough to drop it on your toes it would cause severe bruising. The hazards of abrupt decelleration aside, this is not a book designed for hand-holding, however it is a book packed with ideas. My main interest is in permaculture’s soft systems. We have a lot of know-how about building permaculture’s hard systems, its gardens and farms, buildings and water systems. Soft systems are harder because they are intangibles although they often have tangible effects. They are harder because they include interacting with society’s political economy, with policy, organisations, communication and with individuals. Soft systems are the invisible systems that make hard systems happen. I delved first into soft systems in the book because it has been said more than a few times by its practitioners that permaculture’s biggest failing is its second ethic, popularly described as ‘peoplecare’. That is, permaculture people are good at its first ethic, ‘earthcare’, have variable success with the third ethic, ‘distribute surplus’, but when it comes to working with organisations, social institutions and with each other they often revert to the default competitive mode of mainstream society, with all its deficiencies. It was this interest in soft systems that, after reading the introduction, led me to start reading at chapter 32, Security in Hard Times. On page 490, David writes that we should enjoy living in a “remarkably safe place” and time, and goes on to say that this does not necessarily apply to Aborigines, religious minorities, refugees and people struggling to get by. He is talking about Australia and the legacy of our history as a Western democratic culture. It is true that most permaculture practitioners live in safe environments. They should not feel guilt at their good fortune but use it as a springboard from which to launch into socially beneficial works. This is a sane approach because feeling guilt about our socio-economic and other circumstances is not a viable psychological basis for taking effective action. Being born into a particular ethnicity, culture, gender, socioeconomic group or demographic is not the fault of the individual. What can be the fault is what they do with whatever privileges those statuses bring. Who is Retrosuburbia written for? It is for a small minority of the population as David makes clear on page 491 where he writes “… this book is aimed at a small subset of Australians who already are actively seeking a downshifting path and generally have enough psychological reserves and comfort not to be struggling day-by-day”. He says elsewhere that the book was written mainly for people living in the suburbs of Melbourne and the state of Victoria and, more generally, the temperate zone of south-east Australia. The ideas can be adapted to other regions. Downshifting has been popular for some decades, ever since the shortcomings and the environmental and social damage brought by excessive consumerism started to become apparent. In the seventies the idea took the form of the ‘voluntary simplicity’ movement. The idea never left us although it was submerged by the economic boom of the eighties and nineties. As articulated at the time, voluntary simplicity was a bit too severe an approach for many. In recent times the idea has been modified to imply less self-denial and more enjoyment and conviviality. The best articulation of this resurrection and moderisation of voluntary simplicity would be Annie Raser-Rowland and Adan Grubb’s 2016 book, The Art of Frugal Hedonism. Back in 2006 I attended the launch of Clive Hamilton’s book on downshifting, Affluenza. At the time Clive was with the Australia Institute (his latest book, Silent Invasion, is about Chinese government interference and influence-peddling in Australia’s internal affairs). In the book he discussed some of the same topics that David addresses, such as excessive consumerism and its effects. Downshifting is not new to permaculture. In her teaching, permaculture educator Cecilia Macauley specialises in downshifting strategies, especially decluttering our homes and lives. Retrosuburbia is a companion volume to other works on downshifting and to the work of permaculture educators. David writes that his preferred readers are people searching for more meaning and purpose in life and this “makes us part of the great middle class, if not an unacknowledged elite”. Some will feel uncomfortable at being described as an elite because of the sense of exclusivity and privilege it suggests. Yet, what David says makes sense as it is mainly middle class people who have the personal security and resources to engage in a search for meaning and purpose, to make changes to their lives and homes and to take action on social issues. Some living in socio-cultural enclaves around towns like Nimbin, Maleny and the Castlemaine-Daylesford area might not identify as middle class or might appear to live a downmarket version of it, however their lives and backgrounds often exemplify the privileges of middle class life with its freedom to engage in alternative lifeways. As someone said on social media, we should not feel bad about our privilege — we should use it to do good. It is interesting that David raises the social class structure of permaculture because the design system has repeatedly been criticised as being a middle class preoccupation that attracts mainly middle class participants to its design courses. What he says confirms this perception. Despite shrinkage over the past couple decades and despite many middle class people being heavily in debt and suffering mortgage stress, the middle class is where the potential for social change continues to exist most strongly. At the same time it is a class feeling the pressures of economic uncertainty, that is fearful of job loss through corporate and government restructuring and workplace automation and, thus, of losing the family home. It consequently swings its vote one way or the other, grasping at what politicians promise just in case they really can deliver. We in permaculture should remember that the middle class is not a homogeneous demographic and that it has shrunk in numbers over the years thanks to neoliberal economic policy, workplace automation and social change. Political allegiances, social attitudes and outlooks differ among people who identify as middle class. These are a barrier and an opportunity to permaculture and its latest offspring, the retrosuburbia construct. It is a barrier because some in the middle class will see retrosuburban ideas legitimising an unwanted lowering of their living standards and may be indifferent to it or, perhaps, criticise it. It is an opportunity because the more socially and economically savvy will see in retrosuburbia a different way of living that might have potential to sidestep the challenges they face. How successful the idea of retrosuburbia will be depends on the ability of permaculture advocates and educators to approach demographics outside the existing middle class coterie already participating in permaculture. If that fails, then permaculture and its retrosuburbia sibling could follow the path David, commenting on permaculture in the absence of drivers like the peaking of the oil and energy supply, has said it faces . That is, it could become nothing more than a marginal subculture. Soon after publication, permaculture practitioners in Victoria started a study circle to explore what David wrote. Soon after, the crew that had published the book started offering training workshops to permaculture practitioners in the states. These study initiatives have the potential to lead to a fuller understanding of retrosuburbia. We will see how successful those attending them are in taking the retrosuburbia agenda to a wider audience. 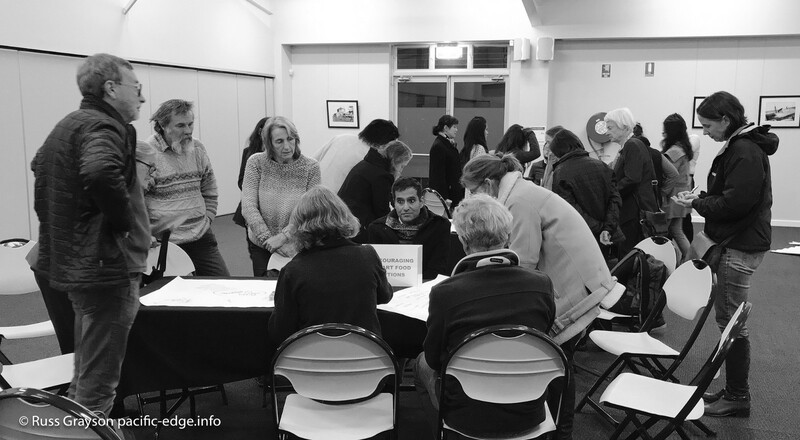 Exploring retrosuburban ideas at a community event at Randwick Sustainability Hub in Sydney. David discusses household security in the breakout on page 492 and cites Victorian permaculture practitioner, Beck Lowe, saying that community gardens with fences and locks “tend to be those that have the most trouble with vandalism and other security issues”. This is the opposite of my experience. The existence of fences and locks is often the result or the fear of vandalism. Over my 23 years of association with community gardening as a practitioner, advocate, trainer and in community garden policy development, including as a consultant and working in community garden development in local government, I find it is the gardens without fences and locks that are most frequently vandalised. This was recently reconfirmed when a local government staff member found an unfenced permaculture garden on council land (not a community garden but a garden with community participation in its management) had been trashed overnight, with plants uprooted and other damage done. This is not an uncommon occurrence in unfenced public place gardens, as is theft of produce grown by volunteers. This makes sense, because gardens with high fences and locked gates are more difficult to break into. The theft of young fruit trees from unfenced community gardens and footpath gardens is common, as I found out when working in community garden development and landcare for a central Sydney council. Some councils require high fences around community gardens. Others, such as the inner urban council I worked with and others I consulted for, discourage them. In part, the reason is due to the shortage of public open space in the inner-urban and higher population density zones. This leads to the accusation that community gardens with high fences and locked gates alienate public open space. Alienation of public land figures repeatedly in local opposition to community gardens. David discusses self-defence on page 494. I go along with what he says about drawing a knife to defend yourself. Like any weapon, that should only be done when you are prepared to use it. Better is his solution of learning martial arts for self-defence. Better still is practicing situational awareness. That involves observation and having an awareness of your surroundings through which you can detect potential threats and avoid them. Once learned, situational awareness fades into the psychological background where it remains active. Retrosuburbanites are presumably favourable to edible and other plantings on suburban footpaths. Here, too, David’s addressing personal security is relevant. I again draw on my experience in local government in a role supporting community gardens, footpath plantings and food systems in reporting that when people in an inner-urban enclave abutting the CBD wanted to plant edible species like citrus on their narrow footpaths, I suggested they space trees and avoid dense plantings so they did not block the passive surveillance of people in the houses along the street. That contributed to safe passage for pedestrians. Mobile minimalism: better that a fixed address? David writes that in an energy descent future mobile lifestyles (popularly referred to as ‘vanlife’ thanks to exposure on Instagram) offer some advantages over location-based living, what he calls “in situ” life. This — mobile minimalism versus the fixed address — is the focus of online discussion and numerous books, however there appears to be no substantial analysis of it from the resource-use and sustainability point of view. Some say it is t less-resource intensive than living at a fixed address, however such comparisons are subjective because of the variable minimalism with which people live and travel, the frequency and distance of travel and the time spent living in their vehicle in a location. It would take a substantial study of a large number of participants to come to a definitive finding. The greatest costs in mobile living, even if that is only for weeks or months rather than fulltime as now practiced by what is a growing number, are fuel and food. For the less-affluent, there are the supermarkets that can reduce food costs. Others buy local foods in the towns they pass through or stay in. A reliable van reduces maintenance costs, however insurance, registration, maintenance and repairs are expensive and must be factored into the lifestyle. Van dwellers do well to have a financial reserve on which to draw. There is fuel for cooking, commonly gas, however this is not a high-cost factor. Fuel use depends on how much driving the mobile minimalist does. Some stay in a location for weeks if not months, sometimes to accumulate income through temporary work. A systems view would take into account the broader financial and environmental costs of mobile minimalism, of van life, such as infrastructure like roads, other engineering works and the official and unofficial campsites upon which the lifestyle relies. Those, too, are used by people living fixed address, in-situ lives. It is arguable that in-situ dwellers might use transport infrastructure as much as than those living the mobile lifestyle if they commute by private vehicle to-and-from work. David writes that the small number of possessions the mobile minimalist has makes them less of a target for thieves. This is probably so in some situations, however some vanlifers (they are known as ‘digital nomads’), make a living on the road, commonly in IT or online systems design and maintenance. This means that they have laptop computers and cameras and these make their vans attractive targets for thieves. I see David’s suggestion of the mobile minimalist as less of a theft target as a ‘maybe’ thing. Sharing ideas for the region at a public event at Randwick Sustainability Hub in Sydney. On page 498, David says that complaints are the main cause of councils taking action against householders. I concur. Councils will often respond only after receiving a complaint. In a case I know of, someone complained about a footpath garden a householder made. Council forced the householder to remove it. As for the footpath garden outside the neighbouring house, there was no complaint, so it remained. The perception of neighbours was of inconsistent and reactive council decision making and poor policy. Acting on complaints highlights the lack of due process in council decision-making because there is little, often no, defensive argument accepted by council. This means the most vocal and vexatious people become the arbiters of what happens in our public places. That is not good for permaculture. I have seen how NIMBY (Not In My Back Yard) complainants attempt to prevent permaculture and allied projects in public places. NIMBYism is a significant element in the culture of complaint that permeates our society and, while it is sometimes justified, it is often the work of selfish people trying to force their demands on others. Clearly, reform is needed. My question is, given the avoidance of politics often evident among permaculture practitioners and the reality that permaculture organisations have not developed an advocacy capacity, whether permaculture would play and role in reform. Murray Bookchin’s writing on municipal libertarianism might be of interest to David where on page 499 he raises the notion of self-governing neighbourhoods. Bookchin’s model is based on local assemblies from which democratic government at larger scale grows. In implementing self-governing communities, organisers would come up against personal and group self-interest and a prevalent lack of skills in decision-making and self-management. Perhaps that could be overcome. Doing so would be no small task. The lack of social planning and decision-making skills is far from absent in permaculture circles. I draw on decades of involvement in the design system and in related areas in saying this. Even prominent permaculture organisations can lack logical and effective decision-making, group and democratic process. Is it that community self-governance beyond the level of the like-minded coterie (such as a small intentional community or people with common interests) is a good idea not yet fully realisable at scale? The question is this: how would communities seeking to become self-governing learn from those that are successful? The idea of self-management reaches back to the 1970s and the worker-self-management movement of that decade, exemplified in the Lucas Aerospace initiative. It may have lacked the prominence of other labour movement initiatives, yet the idea of worker self-management and the notion of community self-management that attracted interest around the same time gained a following among some in the trade union movement and the political Left. The Left seems to have abandoned the idea of worker and community self-management. When those ideas appeared, the Left was the locus of socially innovative thinking but in later decades it sort-of went to sleep. It still slumbers. It’s watered-down, present-day manifestation as the Australian Greens is a barely-noticable shadow of that earlier Left that attracted so many of the youth who wanted economic and social change and a fairer society. I recall no mention by the Greens of worker and community self-management. Any from that time migrating to permaculture may have seen their leftist fervour blunted by a movement that eschews radical social and economic change in favour of gradualism. Our voluntary bushfire brigades, emergency services, bushcare teams as well as other voluntary initiatives demonstrate that a capacity for community self-organisation continues to exist. How can those setting out to educate people about retrosuburbia make constructive links to those examples and extend them into other forms of community self-help and decision-making? Self-governing communities would require something else, something that those who have worked in local government or community development will recognise as frequently missing. 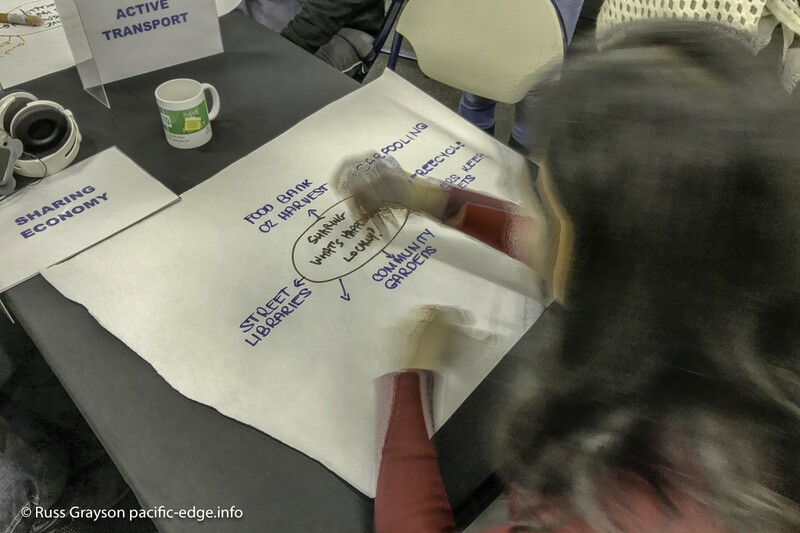 That is the skills in negotiation, decision-making, problem-solving, cooperation and collaboration that would underwrite self-governing communities. Communities are often conflicted zones in which factions coalesce around some issue and assert themselves, setting up win-lose situations. Argument can get loud, insults hurled, people verbally and physically intimidated. Local government staff often bear the brunt of this community ire, or the ire of a segment of a community, even when they try to resolve it. This I have witnessed while working both in local government and outside it, and have dealt with people in groups whose selfishness was so profound there was no way they would cooperate with others. Like my partner who works in local government in sustainability education, I find missing those qualities I mention above that are critical to community self-management. She, at least, educates people in leadership skills and, as the permaculture principle goes, ‘ works with those who want to learn’. It is one thing to propose self-governing communities when you are immersed in permaculture and constantly surrounded by like-minded people. It is another when you deal directly with communities. Permaculture people and their organisations are not always shining examples of effective self-management and at times have demonstrated some of those bad behaviours. Not all those attending Australasian Permaculture Convergence 10, for example, were aware of the early morning conflict resolution meeting called to smooth the way for deliberations later in the day, or of the factional behaviour of those critical of Permaculture International Ltd (now Permaculture Australia). Only the few who witnessed it will know of the bad behaviour of a Permaculture Australia board member, at a meeting some years ago, towards a long-established female permaculture practitioner who was trying to assist the organisation. It is probably out of defensiveness that the lack of due process within permaculture organisations is widely unacknowledged. Within the permaculture movement in Australia (and Aotearoa-New Zealand) there are individuals training permaculture people in those skills critical to effective self-management, people like Robyn Clayfield, Robina McCurdy, Fiona Campbell (as a local government educator Fiona’s focus is on people in the broader local government area rather than within permaculture). There is only so much these people can do, and it is the reality that those volunteering for their courses and workshops are already inclined towards cooperation and effective leadership. Unless permaculture as a social movement can adopt due process within its own organisations, is it in any condition to tell others outside the movement how to do community self-management? This was a challenging chapter to start reading Retrosuburbia. It was also interesting in that a great deal of what David writes pertains to my own experience in regard to communities both within and outside the permaculture milieu. Readers might get the impression that there is a lot of work to do on the capacity for self-management and due process within permaculture. In asserting this I point out that is far from my own idea and has been reiterate by permaculture people over the years. I mention incidents within the permaculture movement that did it little credit in the belief that we have to talk about problems so as to improve. Focusing only on the positive simply sidesteps what needs improvement although we need to figure out how to multiply the incidence of the positive. My comments refer mainly to what David writes about self-management, something I am heartily in favour of. The presence of practitioners (why is it only women that comes to mind?) offering training in the necessary skills I take as evidence that progress can be made. Reading David’s chapter raised the points I mention above and harks back to edgy ideas coming from earlier social movements. So, in a sense and as far as those ideas are concerned, permaculture’s thinking is a continuity. We can learn and adapt the experience of those earlier initiatives. There is much that permaculture can contribute were its ethics and various principles, those of David and Bill Mollison, to be seriously applied. I’m not going to recommend people read David’s book in my higgedly-piggedly fashion by jumping in at the part that most interests them. Perhaps it is better to start at chapter one and go forward from there, especially if you want to gain insight into David’s thinking on the issues that are the basis of the book. There is much to agree with in what David writes in this chapter. There is also more to explore in the topics he raises. Retrosuburbia, 2018; David Holmgren; Melliodora, Victoria. 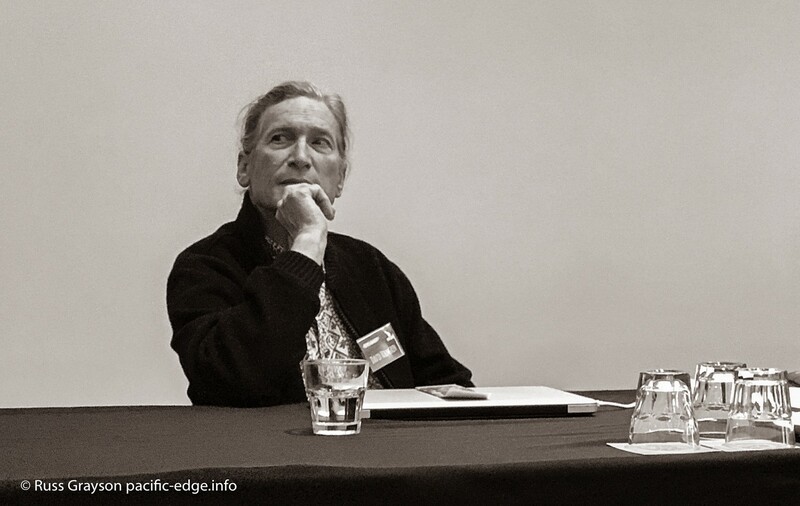 Author of Retrosuburbia, David Holmgren, adopts a thoughtful pose at the New Economy Network Australia’s 2018 national conference in Melbourne.